The narrow strip of stage is littered with wires, screens, projectors and cameras, the electronic detritus of multimedia performance artist, Mamoru Iriguchi. There are four rectangular screens, two placed equally either side of centre stage, and on top of each is a seat number from the Royal Opera House: Balcony B2, Stalls A15, A16 and Dress Circle C54. Iriguchi’s training as a zoologist and his fascination with video evidently influenced his original concept of creating a ‘dramatic tapestry’ of different perceptions (from different seats in the house) of a single performance. In One Man Show Iriguchi plays both performer and (onscreen) audience but his subjective concept has turned in on itself and becomes a self-parody and his feedback a solipsistic loop. His performance is a mercilessly melodramatic dissection of Hamlet’s monologue To Be or Not To Be and his on-screen, alter-ego audience tells him if he misses a line (he does) or if his acting is up to scratch (it isn’t). What further undermines the concept is that Iriguchi’s self-deprecating humour erases any trace of ego. Every now and then thought bubbles from his ‘audience’ are projected on his screens that say things like ‘Don’t fall asleep, you snore’ or ‘what on earth is he doing now?’ Indeed, it is difficult to know if Iriguchi is taking self-deprecation to a new level of seriousness, or if he and his dramaturgs, Nikki Tomlinson and Selina Papoutsell, are pulling our collective leg. Not all is lost, however; although Iriguchi’s Hamlet and his playing of Ophelia in the traditional Shakespearean way is pure ham, the way he introduces the ghost of Hamlet’s father is a brilliant slip of technology: he knocks over his own image on a screen and the image is immediately projected on to the back wall like a giant ghost. Technician Michael Sowby slurs the ghost’s speech to almost unintelligible basso in what develops into a multimedia trio between the ghost (who doesn’t recognize his son in drag), one of Iriguchi’s alter-egos who has been drinking and offers his own version of Hamlet’s soliloquy, and Iriguchi himself who continues to declaim his lines above the chaos. In the end, one of his ‘audience’ screws up his program sheet in disgust and it drops down on to the stage with the whistle of a doodlebug; it is Iriguchi’s comment on his chances of getting to the final, but he is still smiling. Rick Nodine’s work is called Dead Gig. He is a tall, lightly bearded American expatriate with an academically seasoned look, standing in trousers and a jacket (lovingly picked out by Eleanor Sikorski) made shapeless by a harness connected by a rope, over a pulley, to a shoe hanging in space (beautifully lit by Gareth Green). Nodine’s work ends at its beginning, but he has to take us through the story to arrive there. He starts by asking, “Why was I into a band twenty years after their heyday? Why was I born twenty years late?” As he walks across the stage, pumping his arms front and back, the shoe on the end of the pulley rises, and as he returns the shoe descends. He talks as he develops his improvised tasks, telling the story of the Grateful Dead, to which the Dead in his title refers. His clear text is accented by his movement, and the band’s live recordings punctuate the narrative. At one point he sings along into his shoe as microphone; his voice is powerful, and his singing is pretty damn good. If you consider the voice as a physical instrument, his voice is dancing. He takes the harness off and puts on his shoe as we hear another Grateful Dead song: their music, like a drug, is beginning to have an effect on me. Nodine says he was inspired to dance because of the band; this is his dance of appreciation. I said earlier he is a big man, and seeing him whip around his long, heavy limbs and torso with such power and equilibrium as he gets into the music is impressive. Green provides a light show that suggests at times a 70’s rock concert and at others a Haight-Ashbury happening with a massed flower pattern on the back wall. The more Nodine dances, the more he is out of breath, but he continues to take us through the history of the band, how it became the house band for the LSD-fueled acid test festivals that Ken Keasey staged, how their imagination was given full rein, and how he once saw a Deadhead dancing at a concert, ‘bucking like a bronco, his spine undulating, pumping his arms front and back’, as if in a trance. ‘Dancing in a Dead show could best be expressed as ecstatic dance that was communal but self-absorbed and purely focused on the pleasure of moving to music’, Nodine says in his introductory video. He keeps the beat going, whirling like a dervish, as he takes us into the heart of the matter: Jerry Garcia’s death. He lowers a disco ball covered in a veil, places the veil on his head like Garcia’s mass of hair, puts on a pair of dark glasses, and sets the ball spinning. At one moment he is on the floor in mourning weeds, then standing, listening as if in transcendent communication with the band, his elegant hands crisped, his eyes looking far away. The question at the heart of this piece, Nodine explains in his video, is how the ecstatic relates to the aesthetics of dancing on stage. His performance answers that question, and as he lets the track Death Don’t Have No Mercy wash over us, he transforms us, too, into Deadheads. Dead Gig has been chosen for The Place Prize Final. On the bare stage, under Guy Hoare’s seeringly white light, we see the system of pulleys with small sandbags on the ends of three ropes, hanging inert. There is a turntable either side of the stage with amplifiers and controls. At the start the three performers swing the weights across the space and catch them according to the value reported through the ‘trading floor’: 10,000, descending to 40. As the value decreases the weights’ arc diminishes; at 40 it stops. There are other weighted ropes that the trio hoist up and down themselves from the fly rig, and they also work the turntables, playing ‘excerpts of various vinyl pressings’ to which Birch dances around the weighted sandbags that Ash and Morris manipulate. At one point each takes hold of a rope and shakes it like a trio of bell ringers to the taped voice of an auctioneer in full flood. The ropes look like wild snakes. Ash raises a bag above his head and lets it fall, collapsing to the floor a split second before it reaches him; it remains suspended just above his supine head. The significance of ‘Execute Now’ suddenly takes on a more sinister meaning. To wind up, Ash counts down with hand signals, each a sign for some activity. On four fingers, Morris demonstrates yoga at the front of the stage, rippling his stomach muscles and tattoos; on three, Ash skips across the floor and screams silently; on two Birch and Morris stand either side of two weights staring at us and on one – which also resembles a warning – the three stand back to back around a single weighted rope, like heretics at a stake. Joining the dots in Execute Now is not easy, such is the distance between the abstracted metaphors and what they represent. What carries the work forward is the passion and intensity of the performers. Like the weights, my understanding of the work swings one way and another, never quite finding its point of repose, but perhaps that is what Ash wanted to achieve. After a workout for the theatre crew, the stage is set for a very different kind of performance. From its original, loose, concept to this iteration, h2dance’s Duet has established a remarkably polished form as a choreographed dialogue between the cheerful Hanna Gillgren and the sardonic Heidi Rustgaard. 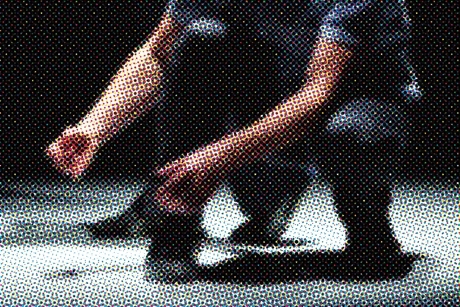 The work is intense in its own psychological way and, as with any work in which Wendy Houstoun has a creative role, it has a rich, dark vein of comic deconstruction. It is brightly lit by Andy Hammond, and Rustgaard designed the cheerfully coloured costumes. Once Hanna and Heidi have established, after deferring to one another, that it will be a duet – not a solo and not a trio – they begin a four-step shuffle that accompanies Sylvia Hallett’s soundscape as the beat of their first dialogue, about the couple therapy session they have just attended (‘haven’t we, Heidi?’). It is immediately clear that the therapy hasn’t improved anything in their relationship. Heidi is the rudder and Hanna the sails and it is all Heidi can do to try to keep the two on (her) course. The four-step shuffle gains a jump and an arabesque, and a little hit-the-leg dance ensues. Heidi adds a head and arms, and while Hanna takes a break offstage, Heidi looks for approval from the audience. That changes when Hanna returns, and lets it all hang out with her provocative pelvic gyrations and moans and the ever-alluring smile. Heidi leaves for a pee, the sound of which is amplified for our benefit, and by the time she returns, Hanna is feeling much better but Heidi is smouldering with frustration. Hanna is not paying enough attention so Heidi takes the smoke machine and blows smoke at her like a pesticide with barely concealed contempt, after which she lies down from the exertion. Hanna calmly stands on her back. ‘You had a breakdown, didn’t you Heidi?’ And I wasn’t there for you, was I?’ Evidently not, as Heidi launches into a calmly disparaging attack on Hanna’s cloud-nine, bubble lifestyle at the time (to a dramatic heightening of the score), while she herself was slogging away at the excel sheets and budgets and promoting the work. While she lists all she had to do and all she achieved, she goes into a routine of push ups, sit ups, neck-ups and rants about cash flow, no flow, overflow, and the Arts Council, until Hanna comes in drinking a glass of water. Rant over (‘Never heard you speak that much, Heidi’), Hanna soothes Heidi’s ruffled ego back to the feel-good four-step shuffle and a long list of analogies. ‘We’re like Gilbert and George (aren’t we Heidi? ), like Morecombe and Wise, fish and chips, bubble and squeak, strawberries and cream, two peas in a pod….’ As the movement phrases and the music gradually fade, Hanna is back in control: ‘We’ll finish there, then… Andy, you can take the lights out now.’ And he does. Duet won the audience prize, and will be in The Place Final.